New Tizen devices singled out for MWC 2014 debut, are we in for phones? Tizen has already found a chilly home in fridges (smart ones, to be sure), but now it looks like the OS is finally ready to ride inside pants pockets. According to press invites for a pre-Mobile World Congress 2014 gathering, Team Tizen wants the world to check out the next wave of devices running the open-source operating system. Smartphones were't mentioned specifically in the invitations, instead promising the February 23, 2014 event offering "an exclusive sneak preview of the newest Tizen devices as well as an opportunity to learn about the major milestones that the Tizen project has hit since last year's event." Phones running Tizen were supposed to arrive in 2013 - and a spec device running the OS was shown at MWC 2013 - but with the year almost up and Tizen no where in sight, we'll put our money on an MWC '14 appearance. 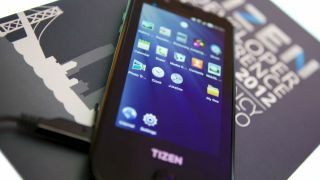 Tizen is backed by Samsung and Intel, among others, and we've seen it on a number of gadgets already, including cameras and leaked smartphones. However, the first commercially ready Tizen smartphones were given a rescheduled release date of sometime in 2014, and MWC 2014 seems an appropriate enough venue for the unveiling. We'll be covering the Barcelona show from the ground, so stay tuned for Tizen news and hands on reviews of any hardware Tizen deigns ready. But first! CES 2014 is right around the corner - here's what you can expect!